Winner of the prestigious Dog Writer’s Association of America Maxwell Medallion Award for Best Human-Animal Bond, this book is both a journal and a workbook to help pet owners work through the intense grief following the first month of having to say good-bye to their beloved pet. In our society, there is often a message that there must be something wrong with anyone who feels despair and anguish over the loss of an animal. Because of this message, the survivors of animal loss are often left feeling alone and crazy because they are having such a strong reaction to their loss. This books contains the seven phases of recovery as well as the four necessary steps of mourning. In addition, there is a list of resources for grief counseling specifically for pet owners. Finally, there is a copy of Rainbow Bridge which every survivor of pet loss needs to read. Gael J Ross is a licensed clinical social worker, and has been in practice since 1971. She has had animals since a young child, and is all too familiar with the pain of losing a dog, cat, bird, turtle or any other animal that may have crossed her path. When she had to say goodbye to her most recent dog, Madison, she decided to create a blog in his memory. From the blog, she thought it was time to write a book to share the many feelings that she experienced during the six months after Madison’s untreatable diagnosis and the months following her loss. Although everyone mourns in a different way and in a different time frame, Gael is sharing much of what she experienced as well as what others have shared with her. It is Gael’s hope that his book will be of help during that first month after the loss of a beloved pet as well as during the long road ahead. 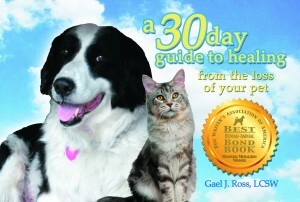 Gael is available for book signings at shelter fundraisers as a means to donate some of the sales to the shelter.